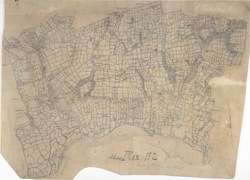 This rough field sketch, or 'foul' copy, was produced on several pieces of irregularly cut paper joined together and laid on the verso of the triangulation map for southern England. Covering the north side of the Thames, East Ham and Ilford are to the left, and Rainham to the right. The drawing is dominated by a patchwork of field boundaries, with open dotting indicating unproductive enclosed land. The detail recorded here was incorporated in the 'fair' map OSD 132, titled 'Barking'.